The men shown presenting to Altrusa’s board are (from left) WHS business teacher/DECA advisor David Penwell; DECA officers Sam Schroeder, Eli Lynch and Trevor Minyo; and Great Oaks liaison Paul Lorenz (in black vest). The seven Altrusa board members shown listening to the presentation are (from left) Kay Walker, Debra Corbell-Grover, Sara Creamer, Jeannie Bihl, Cathy White, Troi Penwell and President Elaine Crutcher. From left are Sam Schroeder, Eli Lynch and Trevor Minyo. Three officers of Washington High School’s DECA club recently updated board members of Altrusa International of Washington C.H., OH, Inc., on the club’s many projects—both completed and upcoming—during this school year. One year ago, Altrusa, made up of professional women from various career fields, agreed to serve as the club’s Business & Industry Advisory Council. Two major upcoming projects: publicizing a March 31 Fayette County Charitable Foundation concert by the Emerald City Jazz; and organizing a fundraiser for 60 new DECA jackets where the amount raised will be matched by the Modern Woodmen of America, one of the country’s largest fraternal financial services organizations. In addition, the students are planning numerous projects at Washington High School to help send the 30 club members who placed at last month’s DECA district challenge on to the state-level competition in mid-March, and presumably several top scorers as well to the DECA National Competition in Orlando at the end of April. 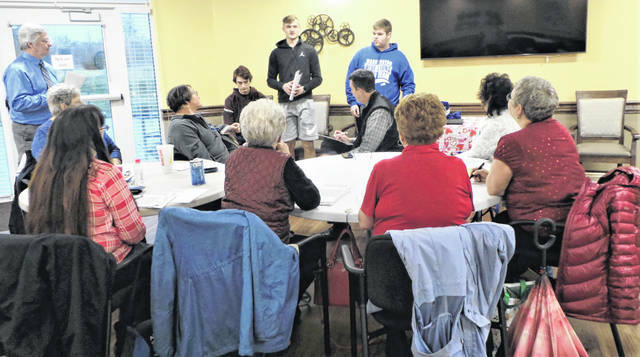 https://www.recordherald.com/wp-content/uploads/sites/27/2019/02/web1_20190207_143944.jpgThe men shown presenting to Altrusa’s board are (from left) WHS business teacher/DECA advisor David Penwell; DECA officers Sam Schroeder, Eli Lynch and Trevor Minyo; and Great Oaks liaison Paul Lorenz (in black vest). The seven Altrusa board members shown listening to the presentation are (from left) Kay Walker, Debra Corbell-Grover, Sara Creamer, Jeannie Bihl, Cathy White, Troi Penwell and President Elaine Crutcher. 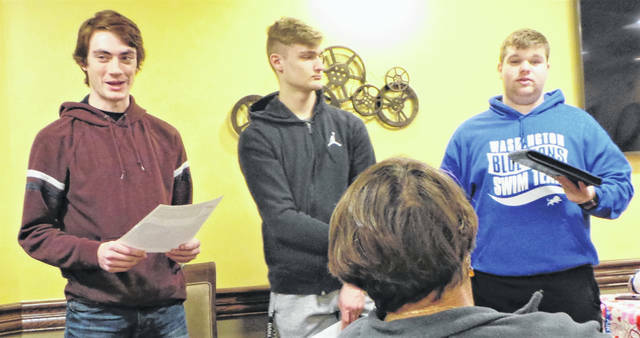 https://www.recordherald.com/wp-content/uploads/sites/27/2019/02/web1_20190207_150047-2-.jpgFrom left are Sam Schroeder, Eli Lynch and Trevor Minyo.